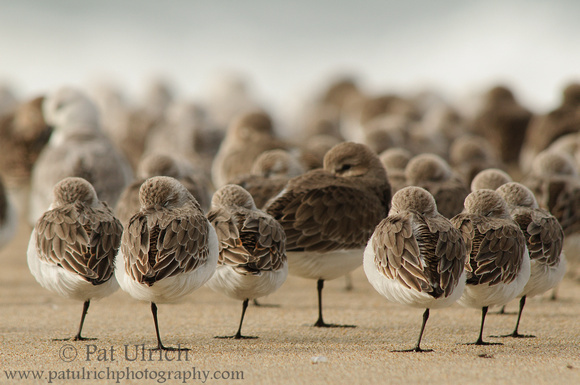 For me, there is no greater photographic pleasure than spending a quiet morning with a group of shorebirds. My most recent trip to Limantour Spit in Point Reyes National Seashore was one of my best encounters ever. It included some snowy plovers, a few dozen semipalmated plovers, and the biggest flock of sandpipers I've ever personally seen. I had the opportunity to take some shots of the flock moving in amazing unison, and hopefully at least a few of them will turn out (check back again soon -- hopefully I'll have a chance to get through all of the images in the near future). For now though, I've decided to post one of a more relaxed variety. Here's a look into a small part of the much larger flock -- a group of western sandpipers gathered around a dunlin. Something about this moment really caught my eye. Perhaps it was the pattern of the smaller birds gathered around the edges, or the fact that all of the westerns had their eyes closed while the dunlin kept watch. And I just love how with seven main birds resting in the frame, there are only seven spindly legs touching the ground. That is an amazing shot! Lots of resting birds standing on one leg, great composition, and I really like the DOF. Quality!